Working from home has some enormous benefits, but one of the biggest perks can also be one of the biggest hang-ups: there’s nobody looming over you telling you what to do. Staying productive when you call all the shots can be challenging, and having the Internet and your home surrounding you 24/7 doesn’t make it any easier. So how do you break these habits and make the most of your time? How do you start knocking that to-do list down to a to-done list so you can get on with your life? Sure, you’re not punching a time card every day, but that doesn’t mean it’s not helpful to know how much time you’re actually spending creating, vs how much time you’re lost in Pinterest. Install a time tracker like RescueTime, and get real about where your time is really going. Once you start to see those patterns emerge, you can start being honest with yourself and setting limitations to get more accomplished. Being a taskmaster doesn’t mean sleeping is wasted time. If you’re not getting enough shut-eye, it’s time to figure out why, because you’re not your best version of yourself when you’re dragging. Being in front of a screen too much can cause major insomnia, thanks to the melatonin-blocking power of blue light. If you don’t already have some, snag a pair of blue light blocking glasses, and always wear them when you’re in front of a screen. Set firm business hours for yourself, and make sure that when work ends, your brain leaves it on your desk. Do a journal dump if you have to, but clear your mind so you can relax and get some sleep. If there’s something on your to-do list you’re dreading, knock it out first. Trust me, you’ll feel 1,000x better, and won’t spend the rest of your day burning through time just for the sake of avoiding it. Your subconscious is a fickle fiend — don’t give it a chance. Never start your day without knowing what you need to do first. At the end of each workday, get your planner out, and get a list together of what you need to accomplish the next day. When you wake up, there will be no standing around like a deer in the headlights, and no excuses for not getting it done. Being overwhelmed is a real thing, so use a to-do list but try to limit yourself to 3-5 tasks per day. If you load on too much, chances are you’ll be paralyzed into inaction by the workload, and totally shoot your productivity in the foot for the day. It’s easy to allow life to seep into work when you work from home. Neighbors drop in, kids beat on your door, and all the while you’re sitting there quietly losing your mind while the day slips away from you. What’s important to remember here is that this isn’t a “them driving you crazy” problem, it’s a “you not setting boundaries” problem. Get firm, get consistent, and get great at saying no to distractions — even if it means putting a “Do Not Disturb” sign on your front door. Procrastinators are the best people at rationalizing things around (I should know, I am one), and nobody is better at justifying a distraction than your subconscious. Don’t let it get away with it. If you find yourself reasoning your way out of taking care of business, try utilizing the 5-second rule. Basically, the idea is that when you decide to do something, you give yourself five seconds to just start doing it. No time to reason with yourself, no time to wiggle your way out of it — just get it done. There’s a term that circulates in the self-help world a lot — “self-sabotage.” The basic concept is that our subconscious tends to set us up for failure sometimes because there is an inherent reward in doing so. We get to feel sorry for ourselves for having to work late. We get to complain about how hard our lives are when we don’t reach our goals. Usually there’s a subconscious process of self-sabotage because, on some level below our rational thinking, we crave failure and fear success. It sounds like bogus, but there’s actually a lot of psychology to support the concept, and if you find yourself repeating the same cycles, you may be experiencing it too. Start learning to recognize these patterns of behavior and know the signs. And when you find yourself slipping, don’t ignore it, don’t even override it with proactivity — journal on why you keep falling back into that. What’s the reward for that behavior? What are you getting out of failing? Why do you fear getting what you want? 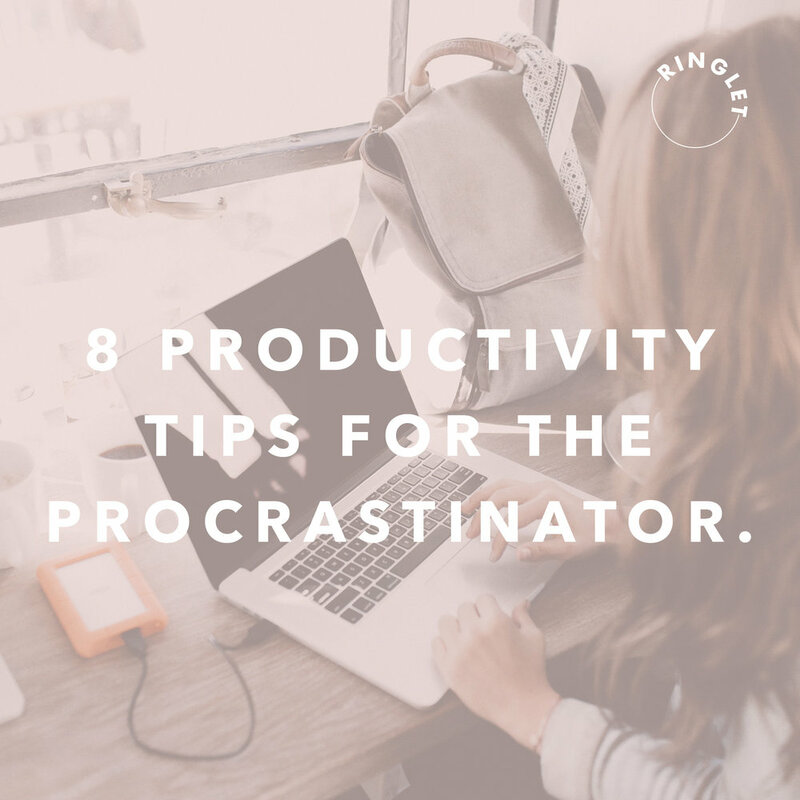 Take it from a recovering procrastinator extraordinaire: this is a tough cycle to break. You’ll resist, you’ll relapse, and all the while, you’ll wonder why you’re clinging so hard to maintaining a constant state of inner turmoil. There is no one-size-fits-all solution, but what you can do it work on this every day, exercising your proactivity like a muscle. Over time, that muscle will get stronger, and it’ll kick procrastination to the curb. So keep going and keep showing up—once you overcome this whole procrastination thing, your dream will be right on the other side. Sign up with your email address to receive our weekly Ringlet - full of news, updates, marketing tips + tricks, girl boss interviews, laughter, community, freebies and so much more! !